Ovarian cyst removal is a debatable issue on which opinions differ considerably. While one set of credence goes in favor of removing cysts surgically, others consider it futile as there is no guarantee that cysts will not form again. Then there are people who believe in alternative therapies and consider homeopathy to be the best course for removing them painlessly and permanently. Of course, there is the third group who think a scientifically planned diet can resolve the issue. Since cysts mostly develop due to imbalance of hormones in the body, they argue, a properly prepared diet would restore the balance quickly. And as soon as this is achieved, the cysts will disappear automatically. But can they stop them from coming again? It would be good to check the advantages and disadvantages of all these treatments before arriving at a decision. So, let us start with surgery first. Gone are the days when serious looking surgeons had to open up the body of a patient to rectify the problem. Laparoscopic surgery has changed everything. Started initially in the form of Keyhole surgery, surgeons today make two or three miniscule holes near the belly of the anesthetized patient to insert the Laparoscope, which is a device that has an inbuilt digital camera that can transmit images of the internal organs to a monitor placed before the surgeon. Carbon dioxide gas is then charged into the abdominal cavity to make the pictures clearer. Guided by the images appearing on the monitor, the surgeon carefully scoops out the cyst from the ovary, which is eventually picked up by a retrieving bag that is inserted through any of the holes. The job is almost done - just the holes need to be sealed. However, there is a singular flaw in this near perfect surgical operation. Since the Laparoscope cannot distinguish between a normal ovary and a cancerous ovary, which has to be physically checked by the surgeon, chances are that the cancer-ridden ovary is left untouched. As most Laparoscopic surgeons are well aware of this drawback, they often opt for Laparotomy, which offers a bigger viewing area for the surgeon to physically investigate the health of the ovary or ovaries and then take appropriate action. In fact, Laparotomy is routinely performed for patients who are above the age of 35 or postmenopausal, since they are most likely to have cancerous ovaries. Another treatment option is Homeopathic titrations. In some cases, surgery may become absolutely necessary, and homeopathic therapies cannot replace surgery. They can however be of immense help to those who cannot be operated upon due to some medical condition. Homeopathy's efficacy in ovarian cyst removal has been corroborated by many homeopathic research organizations from all over the world. But there are others who doubt whether these remedies actually work. And the fact remains that, they may not work in all cases. What do the dieticians have to say about food that can help? According to a dietician with one of the leading homeopathic research institutions in the United States, one of the best natural ways of ovarian cyst removal is by changing to an alkaline diet. This seems to be working because cysts do not thrive in alkaline situations. The diet should consist of vegetables, roots and tubers, nuts and legumes and of course, fresh fruit. Citing the food habits of our ancestors that lived centuries ago, the dietician argued that these people lived on a totally different diet than what we consume today. Their meals consisted of very little processed food but plenty of plant based foods. As mankind progressed, we started having grains, pasteurized milk, dairy products and sugary substances. These foods invariably release acid into our bloodstream as against our ancestor's diet of fruits and vegetables that released alkaline substances. Since our blood is somewhat alkaline with a pH level between 7.35 and 7.45, it may be better to maintain it. 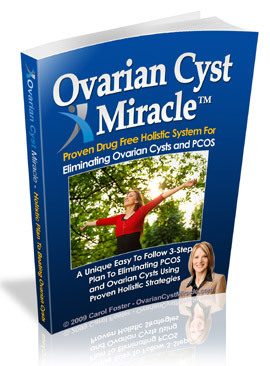 This will automatically reduce the number of cysts in the ovary. But dieticians too cannot guarantee that the cyst will never again. There are many treatments, but at lest they can reduce or remove the symptoms. But a permanent remedy may not be achieved because these therapies treat the symptoms and not the root causes. Holistic remedies remain the only real option. Treating the body as whole, holistic remedies treats all the root causes and once they are gone, the cysts go away permanently. This is why holistic remedies have been so successful with ovarian cysts. Discover How I Cured My Painful Ovarian Cysts in Less than Two Months Without Resorting to Drugs or Risky Surgery Click Here!